At 85 years (and counting), Camp Royaneh is the oldest camp in the SFBAC and was the second permanent Scout camp of the San Francisco Council when the property was acquired on April 15, 1925. Camp Royaneh is also regarded as the oldest continuously operating Scout Camp west of the Mississippi. However before Camp Royaneh was acquired, the summer training camp for the San Francisco Council was located at Warner Canyon in Mill Valley in 1917 and then near Olema from 1918 until 1919 and then at Elim Grove in Cazadero from 1920 until 1924. Each of these locations was not owned by the San Francisco Council which meant the council could not set up a permanent training camp, however this would change. Having operated the training camp at Elim Grove for a few years, the leaders of the San Francisco Council were well known in the small Cazadero community. In early 1925 the San Francisco Council seeking a permanent location for a new summer training camp, was able to purchase the nearby Watson Ranch from Sarah Watson and her son Charles. The Watson ranch was located adjacent to a tributary of Austin creek known as East Austin Creek and was only two miles from Elim Grove. The 120 acre ranch property was purchased from the Watson’s for $17,000 ($142/acre) for use as a permanent Boy Scout camp. The Watson’s were long time residents of Sonoma County after having moved from the Midwest. Sarah was a former nurse during the Civil War and her deceased husband Greenville was a Captain in Company “F” of the 5th Infantry unit of Kansas. The purchase agreement allowed for both Sarah and Charles to live on the property as caretakers for the remainder of their lives. Unfortunately Sarah passed away only a month after the deed to the property was sold to the SF Council at 93 years of age. Charles passed away three years later in 1928 after collapsing from a nervous condition brought on by his years in the Union army. All of the Watson’s are buried in Guerneville at the pioneer cemetery overlooking the Guerneville River. The name Royaneh came about in May of 1925 when SF Scout Executive Raymond O Hanson held a competition among the scouts of the San Francisco Council to name their new summer camp in Cazadero. A scout by the name of George Hart from San Francisco Troop 54 won the competition by submitting the name “Royaneh” for the new camp. George indicated that the meaning of the word “Royaneh” came from the Iroquois Indians that meant “Camp of Joy” or “Meeting Place of the Tribes”. Over the years the meaning of the word “Royaneh” has changed slightly as others try to reinvent the word, but George Hart’s description from 1925 is what the word Royaneh originally meant. The spelling of Royaneh also changed over the years. The San Francisco Scout newsletter from 1925 until the 1930’s spelled Royaneh with a hypen as in “Roya-neh”. The totem of Camp Royaneh initially was the Indian head which would last 30 years until the 1950’s when Ralph Benson changed the totem from the Indian Head to the Thunderbird. 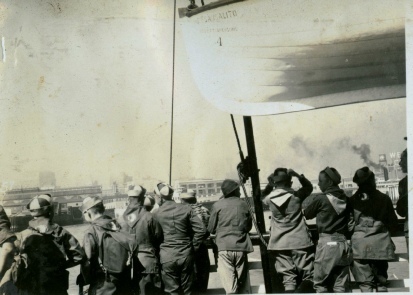 On June 24, 1925 almost five hundred scouts and their leaders assembled at the Ferry building in San Francisco for the first journey to Camp Royaneh. At the head of the Scout contingent was the San Francisco Scout band. The scouts boarded the ferry boat Cazadero which left San Francisco at 8:45am for the trip across the bay to Sausalito and then onward via narrow gauge train to the Watson Train stop where they were met by Raymond O Hanson, “The Chief” as he was known. The train ride to the first Royaneh summer encampment was as scenic as one could image. The route of the Northwestern Pacific narrow gauge took the scouts through the towns of San Anselmo and Fairfax over the grade to the town of Lagunitas through the Redwood forest of Camp Taylor (Samuel P Taylor State park) and then over to Pt Reyes station. From Pt Reyes the train turned north and followed the eastern shore line of Tomales Bay until it turned inland at the Keyes Estuary to the next station at the town of Tomales. From Tomales it was over some more hills, through a tunnel past Occidental until it reached Monte Rio and the Guerneville River. Turning west once more the train followed the river’s south bank until the town of Duncan Mills for the river crossing and then about six more miles over to the Watson train stop and Camp Royaneh. In later years the Watson stop would be renamed the Royaneh stop and is included on official maps of the Northwestern Pacific Railroad. During the first summer a total of 857 Scouts and leaders would use the new facility over a four week summer camp (two, two-week sessions). The cost for the first two week session was approximately $7 for the roundtrip train ride, food and a canvas tent. Water for the camp was drawn from the East Austin creek and pumped up to a retaining tank for use by the camp. From 1925 until 1938 scouts slept in either 4-man or 6 man tents that had wooden floors. The canvas sides of the tent were rolled up and then at night those flaps were rolled down. The opening of Plainsman Village in 1938 marked the beginning of the roof-type wooden shelters that now exist at Royaneh. Plainsman Village was the prototype and they were able to learn from the mistakes. Each cabin had a cabinet for the Scout to put his clothes in. After Plainsman they built Frontiersman, Foresters, and finally Pioneers, on the top of the hill. The strictly tent sites of Lion’s Den, Kiwanis Grove, and Rotary Rancho are named for various fraternal benefactors. In 1927 the first “Pigeongram” was sent from Camp Royaneh to the leaders in San Francisco. This trained carrier pigeon was brought up to Royaneh were a message was attached to its leg and released. The pigeon made the 75 mile journey back to San Francisco where the message was read at the council headquarters. It is unknown how long the flight took but it was certainly faster than standard mail. By 1928, the San Francisco Council was in fine financial shape to be able to pay off the mortgage to Camp Royaneh as well as being able to purchase a new Camp (Lilienthal) for their weekend retreats. In 1934 Clark’s Grove (a large grove of Redwood trees in front of the dinning hall) was dedicated at Royaneh in memory of Samual Clark who was Vice President of the San Francisco Council and Chairmen of the camping committee that readied Royaneh for its first Summer Camp. In 1937 Raymond O Hanson retired from the San Francisco Council after serving 20 years as its Scout Executive and John Tilden took over as the new exec. Less than one year later Camp Royaneh would be renamed. Charles C Moore was the President of the San Francisco Council from 1919 until 1928. He was also the Vice-President of the National Board of the Boy Scouts of America from 1928 until 1930 and the President of the Pan Pacific Exposition in San Francisco. Moore was responsible for acquiring Camp Royaneh in 1925, Camp Lilienthal in 1929 and was instrumental in creating the Crescent M hiking treks in the Sierra’s. Although Charles Moore would die in 1932 his name would live on. At the April 13, 1938 board meeting of the San Francisco Council, the camping committee recommended to the Executive Board to change the name of Camp Royaneh to Camp C.C. Moore in order to “perpetuate the name of Mr. Charles C. Moore”. The motion passed the board thereby officially changing the name of Camp Royaneh to Camp C.C. Moore. From 1938 until 1948 the name Camp Moore was used on all Council literature when it referred to the camp formerly known as Royaneh. The name of “Royaneh” never disappeared as the term was still used by the council to refer to their two camps (Camp Moore and Camp Lilienthal) as “Royaneh Camps”. The patch used at both Camp Moore and Camp Lilienthal was the same patch however if you attended Camp Moore you received an “M” to attach to your patch or an “L” if you attended Camp Lilienthal. This lasted until the 1950’s when patches specific to Camp Royaneh and Camp Lilienthal were released after the name of Camp Moore disappeared for good. The name of Camp Royaneh returned in 1949 or 1950 after Oscar Alverson became the new Scout Exec. An unsubstantiated rumor has it that the board was expecting the wife of Charles Moore to eventually leave the Moore estate to the Council either when she died or at some other time. It is unknown if this is true or not, but the name of Camp Moore was no longer being used after 1950. This may be due to the dedicated staff, campers and other persons associated with Royaneh that would not let the name Royaneh (named by Scout George Hart in 1925) disappear. In March of 1886, the North Pacific Coast railway (later the Northwestern Pacific) extended its rail line from the Russian river town of Duncan Mills eight miles north to the town of Cazadero. This line extension was used to take advantage of the extensive redwood timber stands along Austin Creek that were owned by the railroad directors at the time. The rail line was narrow gauge (three feet wide between rails) and for the most part traveled up the west side of Austin creek while making a few necessary creek crossings between the current entrance to Camp Royaneh and the town of Cazadero. In 1926, the narrow gauge line used by the Scouts for both Royaneh as well as the earlier training camp at Elim grove was converted over to Standard gauge (4’ 8.5”). With the opening of the standard gauge in 1926 new business came to the Cazadero line in the form of special summer trains to Camp Royaneh. Specials ran all summer long with Northwestern Pacific train 222 and engine #20 (a 4-4-0 steam engine) doing most of the business for the Scouts. 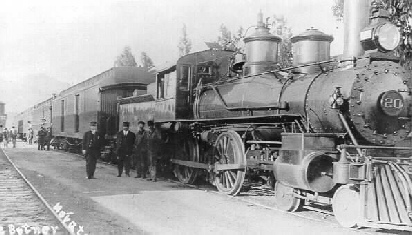 The Rodgers Locomotive and Machine Works Company of New Jersey built the Northwestern Pacific steam engine Number 20 in 1884. The engine had four 62” drive wheels, 18×24 cylinders and a weight of 93,800 lb. The distance from Sausalito to the Camp Royaneh stop was approximately 77 miles. The trains to Camp Royaneh and Cazadero ran for ten years until 1936. In 1936 due to low rider ship and freight movement, the entire line to Guerneville, Duncan Mills, Cazadero and beyond was removed from service. Engine number 20 which had served the Royaneh Scouts for many years was scrapped in 1936 after closure of the line.